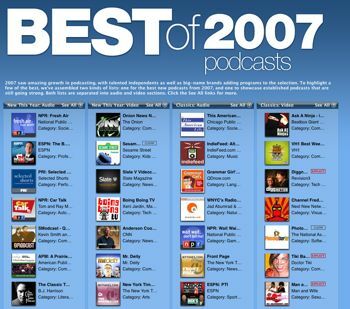 Apple has updated the iTunes store with a directory of their top podcasts of 2007. Lots of the usual suspects, including Sesame Street, NPR’s Fresh Air, Ask a Ninja, Grammar Gril Diggnation, Boing Boing TV & Tiki Bar TV. It’s a great starting point, though, for people new to podcasting. Another demonstration of the fact that Apple has done more than any other major company to promote podcasting. — But wait– mine isn’t on there. Who do I have to pay off? Can’t seem to find that section… Anybody got any clues? Drew – sorry we didn’t link to it. If anybody has tips on linking to a index page within iTunes, let me know! You can link to an index page by right-clicking on the arrows that lead to the next page and saving the URL. I just figured that out. It’s weird cause it points to the next page not the one you are on. yay. We made the list! Apple may have helped podcasting in the beginning but they sure as heck are not helping the space now nor have they helped the space in a long time. Robert – thanks, I added a link. Todd – is any other company doing more to raise awareness of podcasting than Apple? Why you so harsh on them? The page you are linking to – is it avaliable outside US? – definitely not in Denmark. Congrats to all, indies and established brands…MommyCast is proud to have made the list with all of you! I think Apple has been and continues to be a huge boost to podcasting. To this day, I find a lot of good podcasts by browsing through the iTunes podcast directory. If anybody is interested I have my own list of top podcasts.